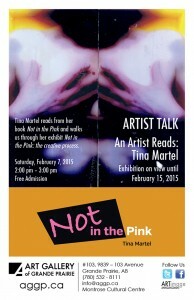 Not in the Pink was first hand look into Tina’s battle with cancer. I cried, laughed and felt anger as I read page after page. I was drawn into each emotion portrayed from her artwork illustrated on every page. It is a book that is extremely hard to put down and has given me a new perspective on the lives of people who have been diagnosed with cancer. It was an hour ago I myself have received a call informing me that a close family member has lost her battle with this obnoxious disgusting disease. I can only hope that through research and medicinal advances that one day the suffering endured from this cancer will end. Thank you Tina for sharing your very personal journey. Thank you Leah…and I am sorry for your loss. Too many people are losing their lives to this terrible disease. My heart breaks for you and your family.